Over the past day or so, more details have emerged over yesterday’s shootings of Sikhs in Elk Grove, California. The identity of the male victim was confirmed by police as Balbir Singh Dhami, 53, who did not survive. His wife is in critical condition in the hospital. 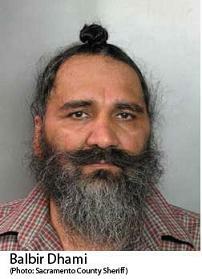 The turmoil of Balbir Singh Dhami’s life in recent years could offer Sacramento police a glimpse into why he was gunned down on a North Laguna Creek street Thursday morning: a fugitive son accused of murder, allegations of aiding and abetting the son, and federal trafficking charges involving hundreds of thousands of dollars in cocaine. For someone who was looking for a motive for this shooting, this history would be the logical starting point. With this shooting occuring in the shadow of the shootings of two elderly Sikh men just minutes away last March, and of the shooting of a Sikh man – Amanpreet Singh, in an apparent bank robbery – in Las Vegas, Nevada also in March (both of which have gone unsolved), this recent attack is alarming. Regardless of motive, within the past three-plus months, there have been murders of four Sikhs – members of a community that is already sensitive to being victims of hate crimes. Just as the case with the rest of America, it is an unfortunate reality that not all Sikhs are law-abiding. Balbir Singh Dhami’s dubious past is very disappointing. While Sikhs are constantly combating unjust negative perceptions, his case will serve as fodder for those who revel in promoting negative stereotypes of immigrants and turban-wearing men. You shouldn’t group these people with the innocent Sikh senior citizens that were murdered. That was a racially motivated crime, the latter was drug/crime related. Just my opinion, no offense! By that I mean your article title, obviously not your content. Gagan, thanks for reading. Your point is well taken. The original title was used when the news of the Dhami shootings just came out and there were few preliminary details. It had struck me that both occured in the same town only minutes away from each other. It wasn’t my intent to group them together given that it is now suspected that the motives behind each of the shootings are very different.